Ukrainian Defense Minister Col. Gen. Stepan Poltorak during a visit to Odesa region discussed issues related to the future of the Ukrainian Navy and voiced hope that the Ukrainian naval vessels remaining in Crimea since 2014 will be returned in the end. "The talks with the Russian side on the return of our naval ships never stopped, therefore there is hope for a positive solution of the important issue," the press service of the Ukrainian Defense Ministry quoted the minister as saying on Sunday. Earlier reports said that Moscow is ready to transfer to Kyiv over 20 Ukrainian naval ships remaining in Crimea after peace is restored in Donbas. 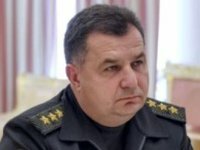 A source at the Russian Navy Main Staff told Interfax-AVN on Wednesday that over 20 ships and vessels of the Ukrainian Navy remaining in Crimea are not used by the Russian Black Sea Fleet and are ready for transfer after the termination of hostilities in the southeastern regions of Ukraine. "As soon as peace is restored and a political decision is made we will take over 20 Ukrainian ships and vessels to neutral waters for transfer to representatives of the Ukrainian Navy," the source said on the sidelines of the International Maritime Defense Show (IMDS). The Navy representative said that the Ukrainian ships are kept at Black Sea Fleet deployment sites; they are fully isolated and not involved in the fleet's daily operations. All of them have remained uninhabited since their crews left them in spring last year. The source stressed that the Russian military guarantee the safety of the ships' moorings. No operations to restore the technical readiness of the vessels are being conducted even though some of the ships are in critical condition. The source said that the return of Ukrainian ships was suspended under a decision of the Russian Defense Ministry in relation to the intensification of hostilities in southeastern Ukraine. Previously the timetable of the ship return was observed. The source said 45 out of 66 units were transferred to Ukraine. They were withdrawn in compliance with the understandings reached by a commission consisting of representatives of the Ukrainian and Russian Defense Ministries. Before March 2014 the Ukrainian Navy had 21 ships and 50 auxiliary vessels in Crimea. Several units were disposed of at the beginning of March 2014 under a decision of the Ukrainian Defense Ministry. The big landing craft Kostiantyn Olshansky, the corvette Ternopil, the minesweeper Cherkasy, the submarine Zaporizhia and others vessels remain at Black Sea Fleet bases. Previously Ukrainian Navy Commander Serhiy Haiduk said that by 2020 the size of the Navy fleet should increase by 30 units.